Graeme Murphy’s Swan Lake is currently making a return to the stage for a brief season at the wonderfully ornate Capitol Theatre in Sydney’s Haymarket district. I was lucky enough to have a ticket for a performance with Juliet Burnett as Odette, Rudy Hawkes as Siegfried and Miwako Kubota as the Baroness von Rothbart. And what an interesting and transfixing performance it was. I never tire of the brief prologue to this Swan Lake where we encounter the three main characters. We understand the apprehension of Odette, the bride to be, shown especially in a Murphy-esque motif of fluttering hands that are like palpitations of the heart, and that also prefigure Odette’s fantasy dream of swans by the lake. The mental fragility of Odette is set against the lust of her groom, Siegfried, as he takes the alluring Baroness to bed on the night before his wedding. But as the first act, the wedding, began I was shaken a little. Both Odette and Siegfried seemed to be two-dimensional characters with little interest in interacting strongly with their guests. Only the sexed-up Baroness seemed to be in character as she flounced her way around the stage. There were a few standouts amongst the other characters—the very feisty leading Hungarian couple of Ella Havelka and Rohan Furnell, a delicious Brooke Lockett as the Young Duchess-to-be, and an elegant Amanda McGuigan as the Princess Royal. But I found the first act mostly underwhelming. As the second act opened, however, Burnett was into her stride, and very convincing as she descended further into a state of mental torment. She twitched and shook as she was bathed by two nuns and collapsed into another world of anguish as Siegfried came to visit her, and when she noticed the Baroness outside the asylum impatiently waiting for Siegfried. And by the time she had moved into the icy world of swan maidens, Burnett had the audience in the palm of her hand. Now there was a calmness to her movements, in beautiful contrast to the twitchy anguish of the asylum. Burnett and Hawkes make fine partners. They move together smoothly and sympathetically, as one really. As a result I wasn’t watching technique, although I did love those expansive sissones from Burnett in Odette’s solo and the very airy grands jetés from Ako Kondo and Dimity Azoury as the two Guardian Swans. But I was following the story, which was developing with immense clarity. And I got the feeling that the rest of the audience was as absorbed in the unfolding narrative as I was. A really unusual and very beautiful, almost palpable silence filled the auditorium. As Act III began the atmosphere oozed glamour and perhaps superficiality, or so it seemed after the moving qualities that emerged from Act II. Kubota’s presence was strong as she took on the role of party hostess. Odette was radiant as she arrived at the party. The central pas de trois, however, between Odette, the Baroness and Siegfried, in which Siegfried’s struggle with himself over what has happened to his love-life comes to the fore, seemed somewhat weak. But with the return to the icy lake, now populated by black rather than white swans, the dancing qualities that marked the partnership between Burnett and Hawkes reappeared. Once again the story took over. It was deeply moving. The trio of Burnett, Hawkes and Kubota has a way to go yet to reach the potential that seems inherent in it. But I was lucky I think to have been at this performance, which got the loud ovation it deserved as the curtain came down. I can’t remember this combination of dancers in these roles previously and it may well have been their first show together. And on another line of thought, what I noticed more than I have on previous viewings of the Murphy Swan Lake was the choreography for the swan maidens’ arms. They are rarely lifted into a ‘regular’ fifth position, not always even a ‘regular’ fifth position with palms turned outwards. His swans have long, slender arms that intertwine, criss-cross, turn their palms in unusual directions, and otherwise form intricate patterns. They reminded me a little of the long necks of the real birds that seem to dip and curve and stretch in infinite ways. I love this aspect of Murphy’s work. There is always something new, something personal, to discover no matter how many times one sees the same show. I have noticed these intertwining arms before, but in this performance, perhaps because it was so beautifully focused on the story and had such a powerful inner strength to it, the choreographic imagery became more noticeable and more expressive. Stanton Welch made his new version of La Bayadère for Houston Ballet, of which he has been artistic director for ten years. Its premiere was in 2010. He has now restaged it for the Australian Ballet, where he still holds the position of resident choreographer. It was always going to be a problematic ballet: an updated version of a work that is entrenched in nineteenth-century cultural values where countries beyond Europe were regarded as little more than examples of exotica, and were represented as such in the theatre. Choreographically, Welch’s Bayadère makes passing references to traditional Indian greetings and hand movements from forms of Indian dance. There are also plenty of attitudes (the ballet step) with angular elbows and hands bent at the wrist, palms facing upwards. They remind us of a dancing Shiva. But there is also a lot of waltzing at certain points and the mixture doesn’t ring true today. So much of what we can accept from a production that claims to look back to the original (Makarova’s production for example), we can’t accept from a new production made in the twenty-first century. It all becomes a frustrating jumble. So too with the costuming. There are no tutus (thankfully) until the Kingdom of the Shades scene, although there is a confusion of costuming, especially with Solor who is dressed like a balletic prince in tights and jacket while everyone else has a costume that approximates an Indian-style outfit. My enjoyment of the work depended very much on the casting. The first show I saw, with Lana Jones as Nikiya and Adam Bull as Solor, was a lack-lustre performance, which only highlighted the feeling that the work was a cultural and choreographic jumble. While Jones’ first solo was beautifully danced—she has such a fluid upper body—she and Bull were not connecting and it seemed like a very sullen pairing. Robyn Hendricks as Gamzatti, whose villainous nature Welch has strengthened nicely, overplayed the role somewhat and didn’t look good in that harem costume, which reveals the rib cage rather dramatically. In that first viewing, I loved the two children who accompanied Solor’s mother wherever she appeared. They were an absolute delight and took an active interest in everything happening on stage. And Vivenne Wong executed the first solo in the Shades scene with precision and attack—those relevés on pointe down the diagonal were spectacular. In a second viewing I had the pleasure of seeing Amber Scott as Nikiya and Ty King-Wall as Solor. My interest in the work soared. King-Wall and Scott danced beautifully together and their various pas de deux were silky smooth and imbued with tenderness. This was the first time I have seen King-Wall in a principal role since he was promoted and he certainly lived up to that promotion, both technically and in terms of successfully entering a role and developing a partnership. Ako Kondo as Gamzatti once again danced with superb technical skill. Perhaps she was a little too nice for the role in its new guise, but she engaged well with Laura Tong as Ajah, her servant, and it is impossible not to be swept away by her superb dancing. The issue of Indian references aside, Welch’s choreography is always interesting to watch. I have written elsewhere that I think his best works are abstract rather than story ballets and I enjoyed watching how he structured scenes for larger numbers of people in Bayadère. His choreography for the Rajah’s four guards was simply constructed but often surprising in the way each came forward for a mini solo. And later, during the wedding celebrations for Solor and Gamzatti, Welch handled a bevy of guards and guests easily and maintained interest, despite the waltzing, in each of the different groups throughout that sequence of dancing. Design-wise, Peter Farmer’s chaise-longue, on which Solor reclined to smoke his opium before the shades of Nikiya began their procession down the ramp, was gorgeous. Its luscious curves gave it an art nouveau feel and its back reminded me of the underside of a mushroom, magic mushrooms no doubt. This production of La Bayadère is full of melodrama, a ‘cat fight’ between Nikiya, Gamzatti and Ajah; people being killed left right and centre; appearances by men in gold paint; and temples tumbling into ruins. But Petipa’s choreography has been maintained in certain places and, with a good cast, the story speeds along and much can be forgiven. Featured image: Ako Kondo as Gamzatti in Stanton Welch’s La Bayadère. The Australian Ballet, 2014. Photo: © Jeff Busby. It is a long time since I have had a seat in the circle for a ballet performance (in any theatre come to think of it), but that’s where I was seated at the Sydney Opera House for Imperial Suite, the Australian Ballet’s mixed bill of Ballet Imperial and Suite en blanc. It was certainly exciting to see Ballet Imperial from that vantage point. Looking down on a George Balanchine work gives a stunning view of the patterns of his choreography—the circles, squares, diamonds, straight lines, and flowing waves of dancers threading their way through the arched arms of other dancers—provided of course that the work on view is well danced and well staged. Which it certainly was at this performance. The ballet was beautifully led by Lana Jones and Adam Bull, with Jones the shining ballerina and Bull the gallant Balanchinian partner. There were some particularly lovely moments in the pas de deux in the first movement. I loved the backwards hops on pointe with the leg in arabesque after Jones rose from a swoon-like fall with her arms around Bull’s neck, and also a little later her lift of the leg to second position followed by a slow pull in to retiré, followed by the same sequence of movement on the other side but at double speed. Both were exciting to watch and Balanchine is so good at showing these things more than once so we don’t miss them! And of course Bull was there supporting all these technical feats. Both dancers allowed us to see Balanchine’s exquisite musicality. Hugh Colman’s new tutus are just gorgeous. Regal in blue and black and one or two complementary shades for the soloists, they are made with sharp lines to the skirt so they seem to represent the cut of a diamond or other precious stones, and they are decorated with a silver sash-like decoration at the back. Very imperial! What a joy the performance was and it inspires me to say ‘thank you, thank you’. And with Eve Lawson on board as a repetiteur with the Australian Ballet—and what an asset she is—I am looking forward to (or perhaps ‘hoping for’ are better words) a revival of Theme and Variations soon. Serge Lifar’s Suite en blanc closed the evening. It is certainly a classically-based work and has many interesting features. Its opening scene as the curtain rises, with dancers arranged on several levels on the stage and clad in various white costumes with a very slight touch of contrasting black, usually generates a round of applause, as it did on this occasion. But Lifar’s limitations as a choreographer are, perhaps unfortunately, highlighted by placing Suite en blanc on the same program as Ballet Imperial. Suite en blanc looks very static in comparison and movement is in no way a static event. Nevertheless, there were some outstanding performances from some cast members and it is always special to see good dancing. Amber Scott and Rudy Hawkes performed stylishly in the pas de deux and Scott was a stand-out in the ‘Variation de la flûte’. But I especially admired Ako Kondo for her technical accomplishments in the ‘Pas de cinq’ and Laura Tong for a beautifully languid and delicious ‘Variation de la cigarette’. This double bill opened with Paquita (or parts of it), a work in the classical tradition of Marius Petipa. 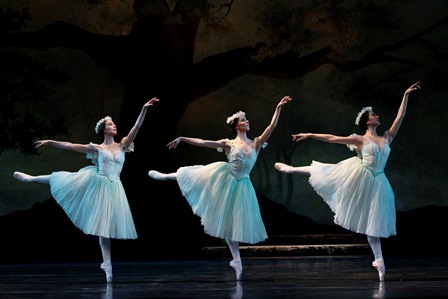 It concluded with a Romantic work, La Sylphide, with the Erik Bruhn choreography after August Bournonville. Putting a work from the classical era with one from the Romantic age is probably a little risky. For such a program to be a success stylistically the company involved needs to have a good understanding of the differences between the styles and, more importantly, dancers who can demonstrate those differences. With the cast I saw, I’m not sure this happened. Paquita was led strongly by Leanne Stojmenov and Daniel Gaudiello and the corps de ballet worked beautifully together giving a performance that made me smile with pleasure at how exciting pure classical ballet can look. The brilliance, the formality, the elegance and decorum that characterise classicism in ballet were all there. Ako Kondo was the absolute star in this performance of Paquita. She had the third solo and her series of relevé turns in attitude and arabesque, and her diagonal of double pirouettes were spectacular. And how gorgeous to see her execute a grand jeté en tournant with the arms lifting and lifting into and through 5th position as if the arms were (as they should be) part of the movement and not just an add on. Wonderful. Other soloists performed well but could not come anywhere near Kondo for pushing the ballet technique to the limit. On the other hand, La Sylphide, led by Lana Jones as the Sylph and Chengwu Guo as James, was a little disappointing. I don’t believe Jones is suited to the Romantic style, or else she was not well coached in her preparation for this role. Although she is more than capable in a technical sense of executing all that is needed throughout the ballet, she looked more than a little coy and her movements seemed stiff, especially in the upper body. She certainly didn’t seem ethereal to me. Chengwu Guo has a a beautiful jump and technique in general. His entrechats and other beaten steps were outstanding, especially in his Act II solo. But it all looked so forced, as if he were trying too hard. And for me the beautiful ballon that so characterises Bournonville was missing. Bournonville doesn’t have to look spectacular, it has to look easy, which is different from hard-edged spectacular. In looking easy it gains its own very distinctive, remarkable appearance. But what was really disappointing was that I thought the supernatural element was totally missing in Act II. Little of the mood had changed from Act I and, really, if the Australian Ballet is going to stage a work of the Romantic era it needs to work to make the dichotomy between the real and the surreal more clear, whatever cast we might be looking at. That dichotomy is at the heart of Romanticism in ballet. See this link for my comments on a second viewing of this program. If this triple bill program from the Australian Ballet did one thing it was to show how far ahead of his time George Balanchine was in 1946 when he made The Four Temperaments. Although the title, The Four Temperaments, suggests a link to the ancient practice of assigning behavioural characteristics to humans based on the extent to which certain fluids are present in the body, I think this is essentially an abstract ballet. It deconstructs classical ballet vocabulary before the idea of deconstruction in arts practice became a trendy phenomenon. So many of the movements—Balanchine’s different examples of supported pirouettes for example—show by the very act of deconstruction how the vocabulary of ballet is constructed. In addition, Balanchine’s use of turned in feet and legs, forward-thrusting pelvic movements, stabbing movements by the women on pointe, angular shapes made with the arms and palms of the hand, are all beyond what the eye is accustomed to think of as pure, classical movement. But seen within the context of the entire ‘Vanguard’ program, it is clear that similar movements surface in the work of choreographers coming after Balanchine. Such an attitude to the balletic vocabulary is especially noticeable in the choreography for Dyad 1929 made by Wayne McGregor in 2009. Balanchine made his move in 1946 (at least) and I think the different look Dyad 1929 and others of McGregor’s works have, which is certainly a look more in keeping with the twenty first century, is as much a reflection of technical developments and changes in body shape since 1946 as anything else. The Four Temperaments is really a remarkable work. The Australian Ballet has been beautifully coached and rehearsed for The Four Temperaments. There was a simple elegance and a clarity of technique in their dancing and they made the choreographic design very clear. At times, however, I wished some parts had been slightly more exaggerated—the movement in the pelvis for example. Balanchine was a showy choreographer at times and I think a little of the showiness that American companies seem to add to The Four Temperaments was missing. Of the two casts I saw I most admired Daniel Gaudiello in the ‘Melancholic’ variation. I loved his unexpected falls, the theatrical way he threw his arms around his body, his very fluid movement, and his wonderful bend back from the waist as he made his (backwards) exit. I also enjoyed the pert and precise quality Ako Kondo and Chengwu Guo brought to ‘Theme II’ and Juliet Burnett’s languorous and smooth flowing work in ‘Theme III’. Of the corps Dana Stephensen and Brooke Lockett (in different casts) stood out for me in supporting roles in ‘Melancholic’. Then came Jiri Kylian’s emotive work Bella Figura with its mysterious lighting and half-revealed spaces. Bella was first performed by the Australian Ballet in 2000 when it had a more than memorable cast, and it has been restaged in the intervening period, again with strong casts. So it is a pleasure to record that one cast I saw on this occasion did not make me think back to other performances. It even opened up for me a new view of the piece. The closing duet, danced in silence by Lana Jones and Daniel Gaudiello, in moody lighting with two braziers burning brightly in the background, was moving, intimate and deeply satisfying. What wonderful rapport these two dancers have and how affecting is their ability to project that rapport so strongly. Jones and Gaudiello were also outstanding in another duet earlier on in the work. I don’t remember such a comic element in that particular duet on previous occasions; this time it bordered on the slapstick. But it was brilliantly done as Jones and Gaudiello managed to retain ‘la bella figura’ in its best sense, while also making us laugh. After these two works Dyad 1929 looked very thin to me. I have admired recent works by Wayne McGregor including his Chroma, FAR and Live fire exercise, and I was also impressed by Dyad 1929 when it was first shown in Australia in 2009. This time I didn’t get the feeling that the dancers saw any diversity within the work. They all performed the steps very nicely but brought little else. After The Four Temperaments and Bella Figura it was a disappointment, not so much choreographically as in terms of performance.